Completed in 2009, The Mandarin Oriental, Boston is one of the most high profile and ultra-luxurious buildings in Back Bay. With 100 condominiums, the initial sellout set several records for largest sale and high price per square foot, which would still make the Top 10 today, even with Millennium Tower on the board. In addition to world-class service and onsite amenities, resident also enjoy direct access to the Prudential Center (including Star Market and Eataly) and Green Line T stations. Rowes Wharf is one of Boston’s most iconic buildings, and is also one of first condo hotel hybrids. Situated between the Rose Kennedy Greenway and the harbor, residents and guests enjoy outstanding water and city views. It’s located in Boston’s Waterfront neighborhood, walking distance to the burgeoning Seaport District, North End, and Financial District, and surrounded by some of the city’s most popular restaurants and attractions. Rowes Wharf also has its own marina, and in the winter the Boston Harbor Hotel converts the rotunda into a skating rink. The W Boston, constructed in 2009, is located in the Theatre District just around the corner from the Public Garden. Situated between Chinatown and Back Bay, it’s surrounded by great nightlife, cultural attractions, and restaurants. The condos feature bold, angular layouts with dramatic floor-to-ceiling city and park views, and the interiors were designed by award-winning firm Bentel & Bentel. Popular onsite amenities include the W LOUNGE, Whatever/Whenever® service, and BLISS® spa. The Carlton House, which was originally Boston’s first Ritz-Carlton, is now serviced by the adjacent 5 star Taj Boston. It boasts immaculate views of the Public Garden as well as the Comm Ave Mall, Charles River, and Back Bay. With only 52 units and an very low turnover, it has a reputation for being one of the most exclusive and expensive properties in the city. Constructed in 1988, the Four Seasons Boston Common is one of the first condo hotels next to Rowes Wharf and The Carlton House. There are 95 condos, ranging from 1-4 bedrooms, with their own private entrance off Boylston St, together known as Four Seasons Place. Located on the Eastern edge of Back Bay along the Public Garden and Boston Common, the Four Seasons is walking distance to Newbury St and all the cultural attractions of the Theatre District. One of the more boutique-style buildings on the list, Battery Wharf is a collection of three buildings, constructed in 2008, with the condos on the top four floors above the Battery Wharf Hotel. The units feature generous layouts, and many have private balconies overlooking the Harbor. Popular onsite amenities include the 13,000 square-foot Exhale Spa and Mediterranean restaurant Aragosta Bar + Bistro. The Ritz-Carlton Boston Common is a dual tower mixed-use development that includes a 114,000 square-foot Equinox Sports Club and an AMC Loews Movie Theater. Located just one block off the park, upper level units offer unobstructed views of the Public Garden & Common, Charles River, Back Bay skyline, and Midtown. Constructed in 2001, the Ritz was Millennium Partners’ first development and only condo hotel in the city (although all of there other buildings—One Charles, MPlace, and the Tower—offer similar hotel-like standards of living). The Colonnade—like The Carlton House—is a two-building complex, with the Colonnade Hotel almost completely detached from the residential tower. Located in Back Bay on the South End border next to Copley Place and the Prudential Center, the upper level residences feature panoramic Back Bay and South End views. The most popular building amenity apart from the hotel service itself is the public rooftop pool, which surprisingly, many locals do not know about. Also, unlike the other buildings on this list, The Colonnade Residences is managed by a small private company and the units are for lease only. Despite being rentals, many residents stay for many years and the building is known to have a great sense of community. Located in Boston’s Waterfront along the Rose Kennedy Greenway next to Rowes Wharf, The InterContinental Boston was built in 2006 and consists of 130 condominiums, from studio pied-á-terres to 4,500+ square foot 3 bedroom penthouses. Walking distance to Fort Point, the Seaport and Financial Districts, and a quick water taxi ride across the Harbor to Logan International. Like the W and the Mandarin, the InternContinental offers a more modern lifestyle experience than some of the city’s other condo hotels. Saving the best for last: When One Dalton is completed in 2017-18, Boston will become one of only eight cities worldwide to have not one but two Four Seasons hotels (both of which will be in Back Bay). Not only that, but at 699ft it will become New England’s tallest residential building (a title currently held by Millennium Tower), and the third tallest building in the city behind the iconic Pru and Hancock Towers. 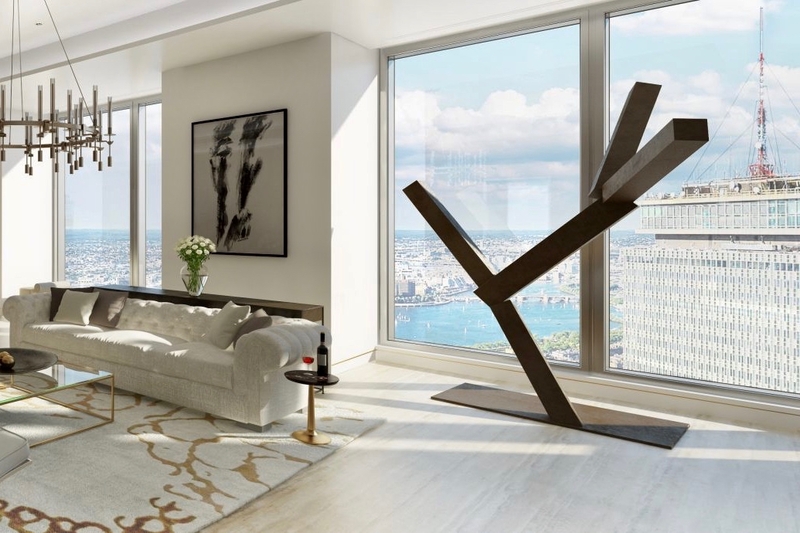 Arguably set to become the most luxurious high-rise or condo hotel in the city, One Dalton is expected to break price-per-square-foot records and may even top Millennium Tower’s Grand Penthouse record sale of $35MM. For more pre-sales information please inquire through the building page or call the the number at the top of this page.